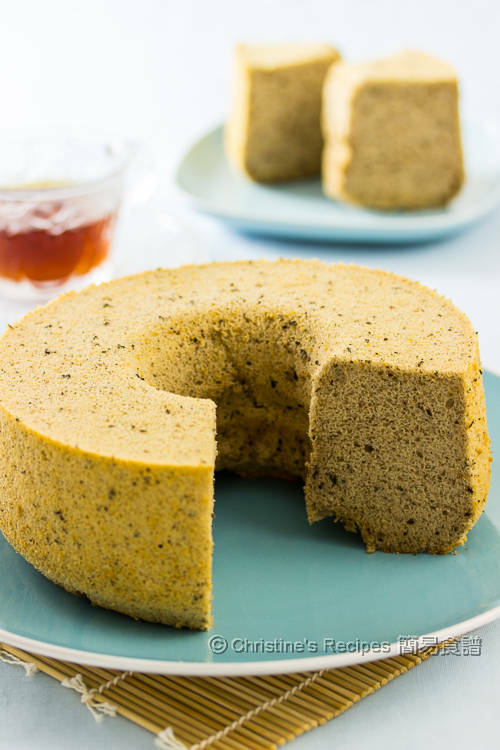 If you love tea and fluffy cakes, this earl grey tea chiffon cake is for you. Even though you don’t drink tea, you’d like it after the first bite. This elegant chiffon cake doesn’t taste too sweet. The earl grey tea liquid and tea leaves smell so fragrant. That’s why this cake is well liked by my family. For me, it’s truly a bliss while having a cup of coffee or tea with a little piece of this soft and fluffy cake, couching to read a favourite book. Yield: Prepare a 20cm / 8 inch round removable based angle cake mould, not greased. 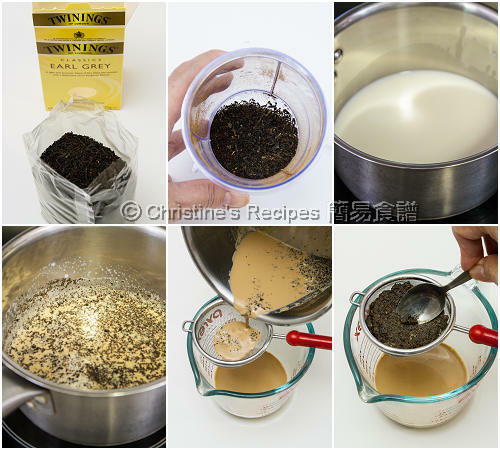 To prepare the earl grey tea milk. I found a flask that perfectly holds my cake pan inverted. Put the fresh milk in a little sauce pan. Heat over medium heat until it’s really hot, not boiled though. Add the earl grey tea leaves. Cover and remove from heat. After cooling down, drain out tea leaves through a fine sieve and keep them. Top up with more milk to get 110 ml if needed. Set aside. Preheat oven to 170C / 335F. Beat egg yolks and sugar in a large mixing bowl. Stir in the tea milk. Add tea leaves. Sift in cake flour and baking powder. Lightly combine together. Stir in one-third of the oil at a time. Combine well and get a smooth batter. Set aside. Pour the batter into the cake pan. Bake in the preheated oven for about 35 to 40 minutes. After baking the first 15 minutes, remove the cake pan from oven. Score 6 lines on the surface of the cake with a sharp knife. Continue to bake until cooked through. An inserted skewer comes out clean. Remove the cake from the oven. Invert the pan immediately on a wire rack. Let it cool completely. I used Twingings Earl Grey loose tea. Process them in a food processor beforehand if you like stronger tea taste. Bear in mind that if using tea bags, the little bag will absorb some milk. Top it up to get the quantity yielded by the recipe. The tea leaves are edible. You can omit them though. Talk about the perfect chiffon! I haven't baked one in a long while...now I am craving for a large piece with my afternoon tea. Hi Christine, the cake looks great! It is unusual that the tea leaves are added into the cake. Will it have some bitter taste when bitten into it? Also, any reason to score lines on top of the cake 15 mins after baking? No, the tea leaves won't make the cake taste bitter at all, just add more flavour. You can skip it if you don't want. The cake will expand and crack once it's heated. The scoring will make the cake cracks more evenly and beautifully. The cake will expand and crack once it's heated. The scoring will make the cake cracks more evenly and beautifully. No need to cut too deep, just 3mm or so, that's enough. 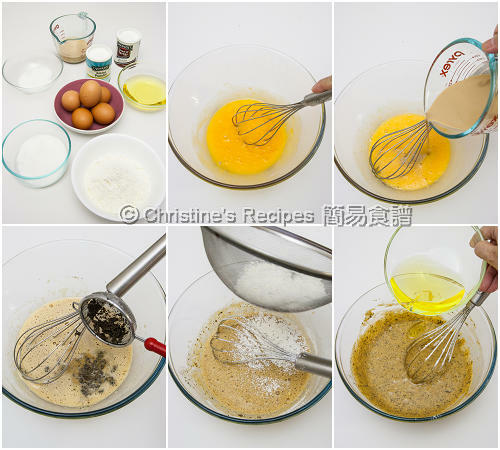 Hi Christine, my chiffon cake tin is 23cm and understand that it should use 6 eggs for 23cm tin. May I know how am I going to adjust your recipe to use on 23cm? As I would like to get high and fluffy cake too. Thanks. why adding the sugar in 3 batches? By doing so, the sugar will be melted and incorporated thoroughly and easily. Can I omit cream of tartar ? love this recipe! The cream of tartar is to stabilize the beaten egg whites. If you can add it, the cake will be better and the cake won't shrink easily. Sure. You can replace with 2 tsp of lemon juice. How Much Sugar Should I Use ? Already listed in the recipe, 20 grams for mixing with egg yolk mixture, 60 grams for beating with egg whites. Great ! Happy for you. I've already posted the pandan chiffon cake recipe on this blog. Please click the link to get it. Hi Christine, I only have a 6inches cake mold, how should i adjust the ingredients? Simply cut down all the ingredients by half. Then it'll fit into your 6-inch mold. All the best MamaDau. Happy CNY to you and your family. Hi! Why do we use non greased pan? Do we need to heat the pan before pouring the batter? As the texture of this cake is very delicate and light, it needs to stick to the sides of the pan to "climb" up. If you use greased pan, the cake will tend to shrink back once it's removed from oven and cooled down. No, you don't need to heat up the cake pan. Hi , I only have a 7 inch chiffon tin . How do I adjust the amount of ingredient ? And I'm confuse , may I know the fresh milk is it measure 110ml then pour into sauce pan ? Or need slightly Abit more ? You might like to to add a bit more than 110ml into the sauce pan to steep the tea leaves, or add a bit more after steeping, because you'll lose some milk in the process. Whichever way, in the end, you need to measure out 110 ml of liquid (tea milk) to make the batter. Thank you for ur advise . Shall try it out . Oh by the way , I baked the Pandan chiffon cake and wow wow is so fluffy and nice ! Hi, lovely cake here! I have a 25cm pan, can you advise on the proportion of the ingredients? Thanks! Many thanks Christine! Will try it out real soon. I'm diabetic and would like to reduce the amount of sugar used in this recipe. Do you have any recommended amount of how much sugar can be reduced without ruining the cake? What's the purpose of the sugar? is it just for flavor? The role of sugar is quite important in making this cake. Not only for flavour, but also for keeping moist and texture. I'm afraid that just decreasing the amount of sugar can't work for you and the cake. May be you can find some sugar substitutes. Think that it's better to ask a staff from a nearby bakery store to suggest you a sugar substitute product, then check it out with your doctor if it suits you. I've been looking for a good Earl Grey Chiffon recipe, and yours looks the best. I have only backed a chiffon once and that was ages ago. I don't really have that cake tin (not sure how you called it) the one with the tube in thimble, can i use normal cake tin by any chance? Another question, i saw the photo you put on in the end, you have inverted the tin on top of something, what was the reason for putting up that high? and do we have to grease the tin with something or it will come out easily with the amount of oil in the recipe? Thanks a lot in advance for your time and effort. Waiting for your reply. The cake tin is called chiffon cake tin. You don't need to grease the cake tin, or don't ever use any non-stick tins because the cake tends to collapse once it cools down. So that's why I invert it immediately after removing from oven. The cake should cling to the sides of the tin. Did you use non-stick pan? Or has your cake shrunk? The batter could be over-beaten. Hey there! I was wondering how heavy 6 egg whites would be as my family likes to buy rather small eggs. I know chiffon cakes are rather delicate and I fear that my proportion of egg whites would be too small. Hi, the eggs I often use are about 55 grams each. Hi Christine, I'm not fond of using canola oil, can I use substitute it with light/mild olive oil instead? Would the texture of the cake be affected? Light olive oil is good. It doesn't have strong smell overpowering the whole cake. It won't affect the texture at all if you use the same amount. Hi! Would it be okay to bake it in a normal cake tin and not an angel cake tin? Sure, you can use a normal cake tin. The middle top of the cake might have a little cave in when cooled down. But it doesn't matter at all. Hi Christine! Sorry if I missed it but what pan size did you use for your chiffon cake? Thanks so much! 20cm / 8 inch round removable based angle cake mould, not greased. Thank you for the recipe, Christine! My friend loves it so much that she's asked for an Earl Grey cake for her wedding! It tastes great every time. Wow, so glad that your friend loved it. Hi Christine, I don't have any cake pans. Can I bake these as cupcakes in cupcake pans? I haven't tried to use this recipe to make cup cakes. You might experiment with cup cake pan though. Hi Christine! 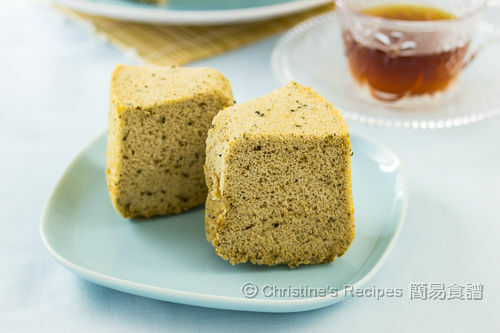 I've always been intrigued by chiffon cakes and I made you earl grey chiffon recipe for the first time! It's SUPER fluffy, light and a lot moister than expected! Just curious as to how much each of your eggs weigh? Our eggs in Australia are generally 58-59g each. Many thanks in advance! I can't wait to make the banana flavour when my bananas ripen more! So glad that you liked my chiffon cake recipe. Same here. I often use eggs that are around 59 grams each too. Thank you. So should I try it with 7 egg yolks and 8 egg whites? You can use 8 egg yolks and 8 egg whites. And increase all other ingredients accordingly. 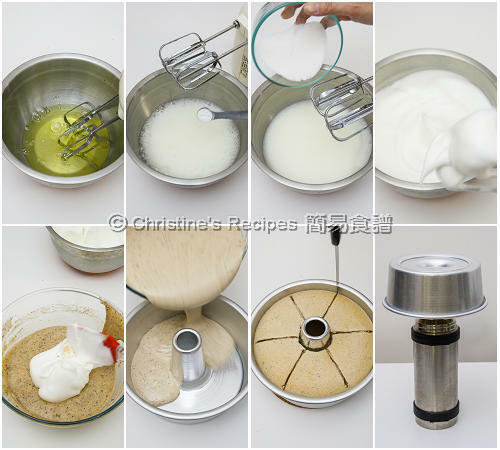 Hi Christine, I tried few of your chiffon cakes with great success, Thanks for your wonderful recipes. 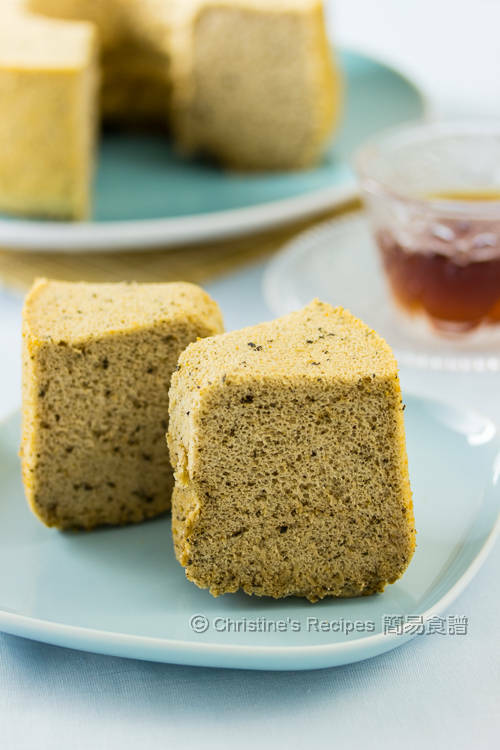 I would like to bake coffee chiffon cake. Do you think I can substitute Earl Grey tea + milk with instant coffee powder + milk? Thanks. Yes, you can substitute with instant coffee powder and milk. Please adjust the amount. Coffee and milk will work. You need to adjust the amount though. Glad that you tried and loved this recipe. Ouch.... the cake was slipping out. Good on you for saving it. Do you use water bath for this recipe? Thanks. No, I didn't use water bath to bake this cake.